Yesterday “bad boy reporter” Jason Mattera ambushed the terrible, left-minded Bono with aggressive questions about his charity work and taxes, posted the video to conservative blog Breitbart.com, and played it on Sean Hannity’s radio show. 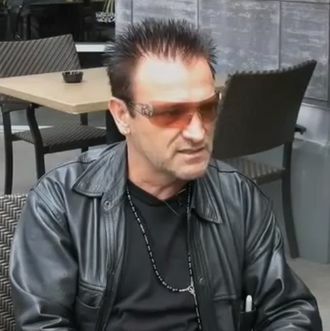 It was a victory for enemies of celebrity hypocrisy … until it was revealed to actually be a victory for celebrity look-alikes: Turns out it wasn’t Bono — Mattera was unknowingly chatting with a Bono impersonator named Pavel Sfera. This isn’t the first time Sfera’s Bono has been mistaken for the real thing, and he is just one of many fake Bonos who have fooled U2 fans and media alike through the years. (Apparently all you need are some wraparound shades, a fake Irish accent, and the ability to sing while leaning and everybody wants you to sign their giant lemon.) For your and Sean Hannity’s educations, Vulture presents a short primer on Fake Bonos in History. The NYC-based group donned their best U2-ish garb and staged a rooftop concert across the street from Madison Square Garden, where a real U2 concert was about to take place. They not only impersonated the band, but their sound guys, roadies, security, and fans in the street. Eventually, the cops showed up and shut it down, which also happened to the fake Beatles. Read the full extensive first person report of the day here: Apparently even a fake Bono concert can be a totally life-changing experience. Probably the second most famous Bono behind Sfera (well, third if you count the real thing), Easter actually toured with the real U2 on the Vertigo tour, performing at all the preshow fan parties. He told the interviewer that he’s one of 50 or so Bono impersonators in the world: “I always knew I could sing like him, but never thought that I could actually make a living doing it.” There you have it, folks. The Canadian Dream: becoming Bono. Would all celebrity impersonators get this treatment? Only fake Chris Martin knows for sure!